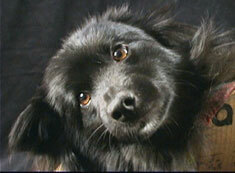 Willie’s first memories are of a litter of black pups, his mama dog, and of never quite having enough milk. Then there was the cage at the dog pound where he and his siblings were kept and weaned. One cold morning a human came, and after much pointing and looking, he picked Willie up and tucked him under his arm. It was the holiday that the humans call Christmas, and Willie was about to begin his life with a human family. Willie’s next memories were of growing up on a small green valley farm. He wasn’t exactly a working farm dog, and he wasn’t exactly a lap dog; he wasn’t exactly a hunting dog, and he wasn’t exactly a lie-around-the-porch dog. He loosely served all these purposes, along with an old corgi named Corkie and the dominant little terrier male, Angus. Corkie became Willie’s surrogate mother, allowing him to nuzzle and stay warm. Farm life was great and little Willie was full of energy. As he grew older he explored farther and farther away, until one sad day he discovered the nearby road. 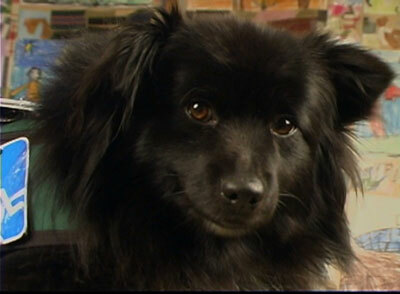 At the age of two, Willie was hit by a truck and left for dead. Luckily, I found him in time and rushed him to the veterinary hospital. The next day we were told he had broken hips, a broken rear leg, and nerve damage in his right front leg, making it almost useless. The vet recommended euthanasia, but I decided that Willie deserved at least a shot at rehabilitation. His hips were set and a metal pin was inserted in the broken leg; then he was released to come home. Willie could not stand or walk, so I rigged a body sling to hold him up for short periods of time, allowing him to use his legs a bit. Six weeks later, he was able to limp around the farm again, but he was a changed man. He no longer had the energy and joy of youth. Willie definitely understood how much we were doing for him and he was genuinely grateful. He worked hard at rehab, but his front paw soon developed a sore from dragging on the ground. Another visit to the vet brought the suggestion of removing his entire leg from the shoulder down. Willie and I declined. Slowly, over the next few weeks, Willie learned to hold his front paw up and out of harm’s way. One night as we humans were watching TV, my wife Adrienne pointed out a show about dogs that visit hospitals and do therapy. “Willie could do that, now that he is a calmer dog,” she said. The next morning, I discussed pet therapy with Willie. He was excited and let me know that when he was hit by the truck, he died and saw a bright flash, then found himself in a long tunnel of light. He met the Big Dog in the Sky, who told Willie he must return and help others. Becoming a pet therapist would be perfect for him, as he had experienced doctors, hospitals, and rehabilitation first paw. From that day on, Willie was a dog with a mission. We applied to the Delta Society for training as a pet therapist and sent for all the necessary documents and training manuals. Willie began to learn the necessary skills for the job: sitting, lying down, accepting aggressive hugs, ignoring noises and distractions, and much, much more. Eight months of informal training later, Willie was ready to SIT for his Delta Society exam. It was a tough and thorough set of tests. At the end of the day, Willie became a licensed pet therapy dog and I became his official partner and handler. He was now Dr. Willie, certified pet therapist. Dr. Willie now walked with pride and a new sense of importance, even though it was still with a limp and only on 3 functional legs. The new doctor began to develop a keen interest in neurosciences, so we applied to the hospital for a position in that department. It took a couple more months to jump through the final hurdles of hospital training. We had to attend volunteer training, make introductory hospital visits, and have our official hospital ID badges made. When we received our photo badges, mine read “volunteer” and Willie’s read “Dr. Willie, pet therapy”. I learned right away that Willie was the doctor and I was just his valet and leash holder. One final visit to the neurology ward in the company of another therapy dog, and Dr. Willie was approved to practice rehabilitation and therapy. Within a few months, the new doctor knew his way around the hospital and was friends with the neurology nurses. He was rehabilitating and curing patients left and right, tireless in his new medical career. On the days when he is scheduled to make his hospital rounds, Willie gets very excited at the sight of his official Delta Society work vest and his ID badge. Dr. Willie is always courteous to other doctors, taking the time to stop and sniff their legs. I think he is the only doctor who is petted by all the nurses and takes a leak on the grass outside after every visit. Dr. Willie is also the only doctor at the hospital that gets into bed with his patients and licks their hands while they scratch his belly. He is a real medical therapy innovator. Imagine his surprise when he discovered a pet therapy dog, complete with hospital ID badge, lying on his back being petted by all the nurses. Dr. Willie, being the professional that he is, did not embarrass the young doctor but instead licked him on the hand. As Dr. Willie grew more accustomed to his medical duties, he began to look for some other form of community service. When we heard about therapy dogs participating in a new school reading program, Willie jumped at the chance to become an educator and teach children to read. Some children are terrified to read aloud in the first grade, and a few of them get time alone in a separate space to read with a therapy dog. As a small, gentle, lovable dog, Dr. Willie is no threat at all. 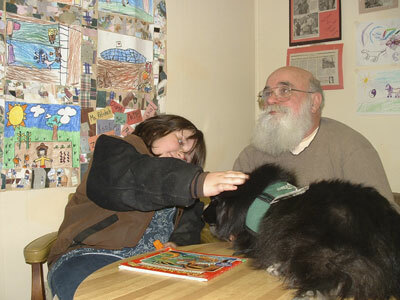 Mostly, this work involves Willie lying nearby, getting petted while the child reads to him. A warm doggie kiss is all it takes to get the process started. After a few weeks, Willie encourages the child to SHOW his or her classmates what happens in their time together. In this way, the child reads in front of the class with Willie at his or her elbow. Both Willie and the child gain great esteem in the eyes of the other first graders. This school year will be Dr. Willie’s 5th year of teaching, in addition to his hospital work, and as you can imagine, he is again beginning to look for yet another type of service to explore and hold his interest. Medicine and teaching can bring a dog of Willie’s intellectual capacity and creativity only so much satisfaction…..
Will he really become a politician? After much thought and research, Dr. Willie has decided to enter politics. He informs me that all politicians are basically dogs and he should have no trouble in Congress. It is a dog eat dog world, after all. Perhaps a really committed dog with credentials like Willie’s can make a real difference in the world. Dr. Willie and I can’t wait to get on the political gravy train. Candidate Willie has already worked out his platform: he is for a fire hydrant on every corner, more city parks, national veterinary care insurance, a bone in every bowl, pay increases for guard dogs, care for all homeless dogs, and a cleaner environment to run and play in. Dr. Willie will take a hard line position against truly unjust leash laws. If elected, he will go nose to nose with corrupt human politicians in a real dog fight. dirt, Secretary to Congressman Willie? Clyde Hollifield, AKA “dirt”, lives on a farm in the Western North Carolina mountains, southeast of Asheville, with his wife Adrienne, three dogs (Willie, George and Pippin), several chickens, trout in the pond, and until the end of March 2007, the periodic raptors he rehabilitated (mostly screech owls). Clyde is a gifted inventor, storyteller, artist, puppeteer, wise woodsman and Renaissance man. See Pinkey’s main page and links for more about Clyde.